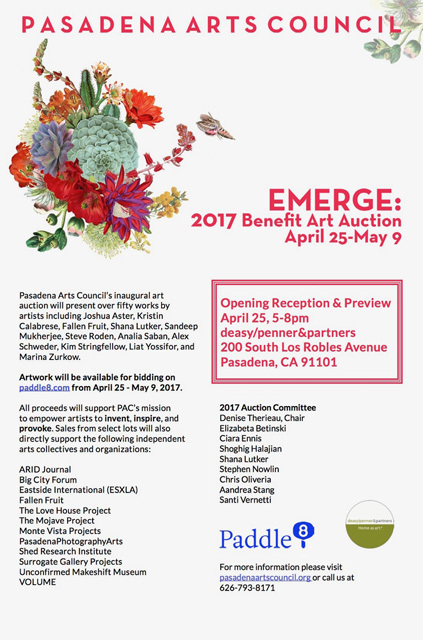 The Mojave Project is pleased to announce our participation in the EMERGE: 2017 Benefit Art Auction held online from April 25 – May 9, 2017 and in partnership with Paddle8 and deasy/penner&partners. This inaugural auction is organized by the Pasadena Arts Council (PAC). As one of PAC’s EMERGE fiscally sponsored programs The Mojave Project will directly benefit from auction sale proceeds. We are currently at the production midpoint and with continued funding we will be able sustain our immersive research and subsidize the print publication of the first two volumes of field dispatches. Project director Kim Stringfellow has donated three limited edition photographic prints from this project including the photograph shown below. Altogether over 50 works representing a variety of important arts collectives and organizations will be available for bidding. We do hope you will consider participating in this event. An opening reception & preview will be held this Tuesday, April 25, 2017 from 5-8 pm at deasy/penner&partners at 200 South Los Robles Ave., Pasadena, CA 91101. For more information please visit Pasadena Arts Council or phone at (626) 783-8171. 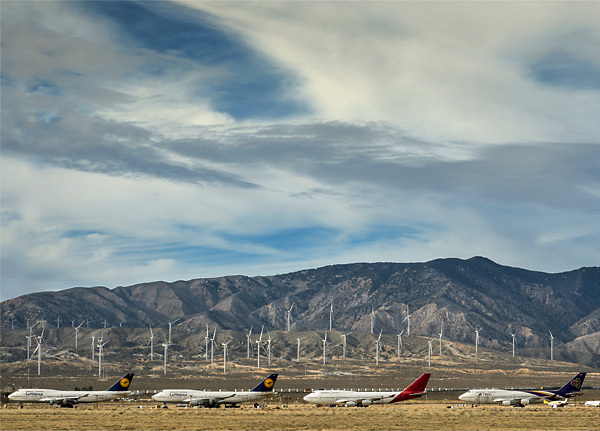 Mojave Boneyard withTehachapi Windfarm, Mojave, CA, 2015, archival pigment print, 22 x 17 inches, 2/5 edition.